Trains depart Industry Depot off Route 251, a short drive from anywhere in the Rochester area! The Rochester & Genesee Valley Railroad Museum and Industry Depot are located at 282 Rush Scottsville Road, Rush NY 14543. We are located on Route 251, only a few minutes from Exit 11 on I-390, and just 20 minutes from downtown Rochester. Proceed on New York State Thruway I-90 West towards Buffalo to Exit 46. Just past toll plaza, bear right onto entrance ramp for I-390 South towards Corning. Follow directions from Rochester Area (below). Proceed on New York State Thruway I-90 East towards Albany to Exit 46. Make your way to I-390 South, towards Corning. Proceed to Exit 11 for Route 251. At the top of the exit ramp, proceed straight across at the light to the stop sign. At the stop sign, make a right onto Route 251 West. Continue nearly two miles to blinking red light continue straight on Route 251. Proceed about one half mile to the train tracks, and the museum will be on your right. Follow signs to parking area. 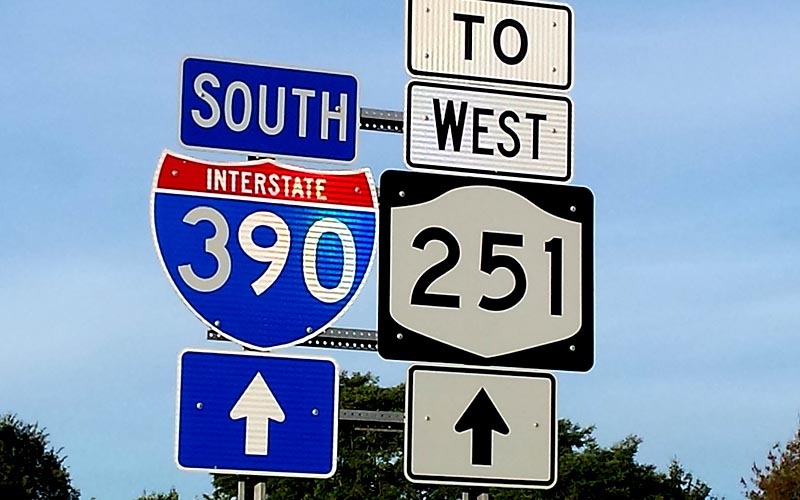 Proceed on I-390 North towards Rochester to Exit 11. At the top of the exit ramp, make a left onto Route 251 West. The closest rail station to our museum is located at 320 Central Avenue, Rochester, NY. Service is provided by Amtrak with several trains throughout the day. Our museum is located about 13 miles from downtown, accessible by local taxi service. Our museum is located less than ten miles from the Greater Rochester International Airport. Rental cars and taxi service are both available from the airport terminal.